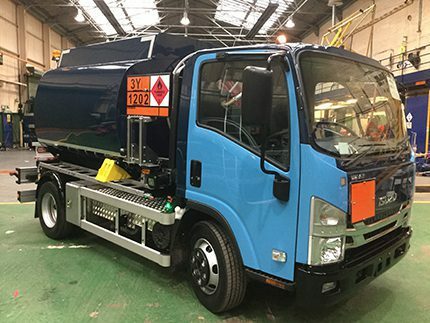 Two new 5,000 litre Isuzu trucks are joining the fleet at Consols Oils. “Despite the serious constraints presented by Euro 6, these small tankers have been built to provide Consols Oils customers with even greater delivery flexibility,” said Kevin Bennetts. Built by Tasca Tankers the vehicles have an aluminium tank with two compartments of 2,500 litres each. Each is fitted with an Alpeco metering system, a Collins Youldon Catherine wheel and are equipped with a 175ft 1” and 3/8” hose. “Everyone at Tasca’s was delighted to hear that Consols Oils was very keen to enter these new trucks for the title of Fuel Oil News 2017 tanker of the year,” said works manager, Phill Sheard. “They may be small but these tankers are fitted with full bottom loading systems. What really sets them apart is their ability to deliver fuel oil in areas others are unable to reach, giving proof that bigger is not always better.